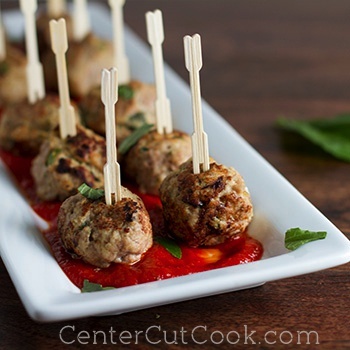 Ricotta cheese is the “secret ingredient” in these turkey meatballs to keep them ultra moist! Healthy, and delicious! If you take a look around CenterCutCook, not a single turkey recipe can be found! Of course, you could sub ground turkey in recipes like this one for Mexican Pizzas or this one for Enchiladas, but the truth of the matter is that I’ve always been a little afraid to cook with turkey. I’ve used it in the past with okay results, but I always found myself thinking “this would have been better with ground beef.” Turkey tends to be dry (for good reason, it’s lean! ), and I guess I just never found the right recipes that knew how to make it shine. While I was in college, I met a lovely lady named Katie. Katie and her husband became turkey farmers a few years ago, and I have to say, reading about their adventure raising turkeys on her blog, On the Banks of Squaw Creek has been fascinating. Thanks to Katie, and her hard working husband, I’ve been inspired to cook with turkey more than once every three years! I’m SO excited to share this recipe with you today, because for the first time, I found a turkey recipe that didn’t leave me thinking, “this would’ve been better with beef!” Meet these little Turkey-Ricotta Meatballs. The ricotta cheese is the “secret ingredient” in these meatballs to keep them ultra moist. I HATE ricotta cheese when it’s used in things like lasagna, so I was skeptical, but you do not taste the ricotta. The meatballs are simply moist, flavorful, and delicious. Once again, as with the Tomato Basil Chicken I made last week, I was able to snip some fresh basil and parsley from my backyard. I just LOVE being able to use my own herbs when I cook! The basil and parsley adds such flavor to these meatballs that’s unbeatable. I ADORED this recipe, and I’m certain you will too. Notes: These meatballs are delicious in several forms. You could serve them Italian style with some pasta and marinara sauce, but they’d also be great on meatball subs with some fresh mozzarella! Additionally, you could also use them in stroganoff type recipes. They are SO versatile, and heat up well as leftovers! UPDATE: A commenter asked about freezing the meatballs which was a great question, and many of you can benefit from the answer. You can definitely freeze these meatballs. Just cook them according to directions, and allow them to cool completely. Place them on a baking sheet making sure that they don’t touch and freeze them for about an hour or so. Then place the frozen meatballs in an air tight container (sometimes I use ziplock freezer bags for stuff like this) and store in the freezer for up to 3 months. When you want to eat them, thaw them in the fridge completely, then bake in the oven for about 20 minutes at 375 degrees. In a large bowl, combine ground turkey with ricotta cheese, bread crumbs, egg, basil, parsley, salt, and pepper. Use your (clean!) hands to mix all the ingredients together. Divide the meat mixture into 18 meatballs. Heat a large non-stick skillet to medium-high heat and spray the bottom with cooking spray. Brown the meatballs for a few minutes on each side. You may need to brown the meatballs in batches. The goal here is not to cook them entirely, you just want to brown them. Coat a large rimmed baking sheet with cooking spray and transfer the meatballs to the pan. Bake the meatballs in the oven for about 15 minutes, or until done.